For more information, see www.applegardenfarm.com. TO THE CORE Gravenstein apples are too sweet for hard cider, so the Lees of AppleGarden Farm have planted 20 different varieties in Tomales. When I visit Jan and Louis Lee, their apple trees have just burst forth in showy white blossoms. The west Marin couple planted 230 trees four years ago and harvested their first crop this past fall, but except for a few trees' worth, none of the apples was fit to eat; they were either too tart or too bitter. Which is just what the Lees want. The recently retired couple built a home on 3.5 acres of bare land just outside of Tomales, but before they drove the first framing nail, they planted the apples. Given Tomales' cool environment, and their own commitment to keeping local land in agriculture, they knew they wanted to produce something. They weren't interested in grapes, sheep or vegetables, so they settled on growing apples for hard cider. "We wanted to do something different," says Jan, who along with her husband is a retired construction manager. Estate-produced hard cider is definitely different. It's ironic that there isn't more of it, given the abundance of apple orchards in the cool, foggy hills west of Highway 101. Of course, there used to be a lot more apples before the ascendancy of wine grapes and the preference for hearty, truck-tolerant apples. Nearby Sebastopol's famed Gravenstein apples aren't made for cross-country shipping, and they're too sweet for hard cider. The Lee's AppleGarden Farm cider is a true farmstead product. The 20 varieties of organically grown apples (crabapples, golden russets, Winesaps, Kingston blacks) that go into their cider are all grown in the orchard. They plan to plant an additional 70 trees, but that's it—they have no intention of sourcing apples elsewhere. "We want to stay small," says Jan. "We're committed to the organic lifestyle." Today, the cider is still in the cellar—a 40-degree walk-in cooler next to the Lee's garage—and according to Jan, it needs a bit more time to round out it's angular, pucker-inducing flavor. But it's meant to be lean and dry. "We do not want sweet and fizzy," she says. I try a little right out of the barrel, and it's dry and crisp, with just a trace of sugar and a light effervescence. Especially at the height of spring, it's delicious and refreshing, and it would go great with a plate of charcuterie and cheese, or spicy Thai or Indian food—or all by itself on a hot day. 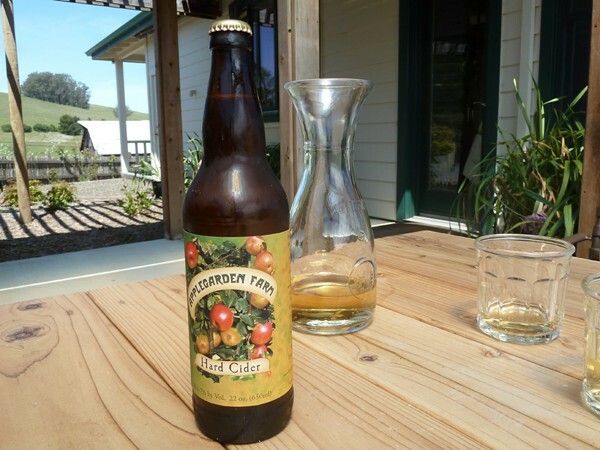 Given west Marin and Sonoma counties' ideal apple climate and the demand for all things local and artisinal, it's surprising to me there aren't more small-batch hard cider makers out there. Jan Lee is hoping more of them get into the game to help create a new cottage industry. "We'd like to have more," she says.